Two kits will be available to represent a couple of 40-foot, 10-inch prototype flat car designs. Kit #2002 represents the F-50-5, F-50-8, and F-50-9 flat cars that had T-Section Bettendorf trucks. The cars had double fishbelly steel center sills and straight side sills with a 50 ton capacity. 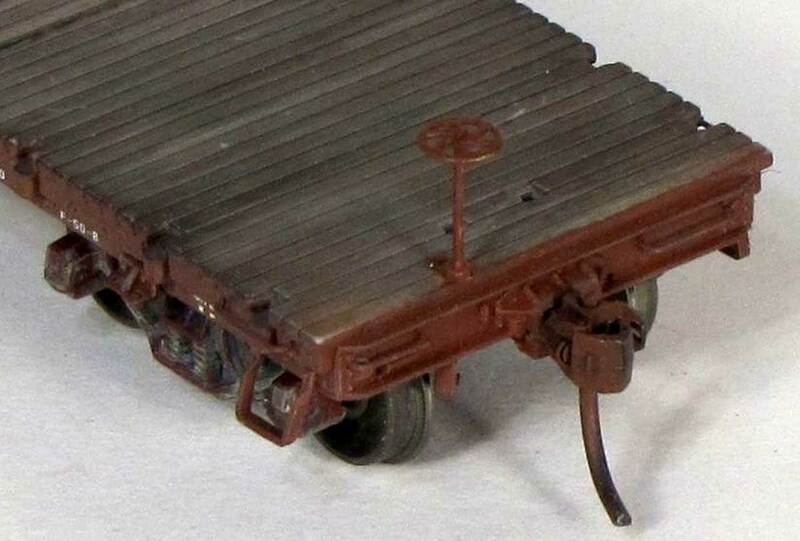 Kit parts will be provided in a freight car red ABS plastic with wood decks cast in a neutral grey plastic. Kit #2002 represents the in-service cars with white SP decals. Kit #2004 represents the maintenance of way cars and includes a black SPMW decal set for 1958-1970s era cars. 850 of the F-50-5 cars were built in 1916, the first of the post-Harriman flat cars on the Southern Pacific Lines. 350 F-50-8 cars were added in 1923 and another 450 F-50-9 cars were added in 1924. Kit #2003 represents the F-50-10 and F-50-12 cars that had U-Section type ARA trucks. The model is seen above in post-1958 maintenance of way duty, which is kit #2005. The SP installed 450 of the F-50-10 cars in 1927 and added 500 F-50-12 cars in 1928-29. These newer cars reflected the earlier car design, including the distinctive side sill with steel angle and wood blocks supporting the overhanging wood deck planks. Additional prototype detail can be found on the Owl Mountain Models website. As with the kits mentioned previously, parts will be cast in a freight car red ABS plastic with the car decks cast in a neutral grey plastic. The in-service cars (kit #2003) will have an SP decal set printed in white letters while the maintenance of way set (kit #2005) has decals printed in black letters for 1958-1970s era cars. This is a pre-production test model. A sheet styrene weight cover has been added to production models so the needle beams can be welded to plastic material. The underframe is nicely detailed with brake hardware. The model above has a KC brake system installed but AB brakes components will also be included in the kits. Note the fine soft brass towing bracket castings at the end of the bolsters and the cut lead weight centered under the deck. The deck casting is produced in a grey plastic and easy to weather with washes, color pencils, Pan Pastels, or a combination of techniques. Decals, trucks, couplers, wire (for grabs, brake staff, & brake rods) and brake hardware will be included. A modeler needs to carefully assemble the parts and apply a coat of paint before decaling. These Owl Mountain Models SP flat cars are a welcome addition to the HO scale freight car selection. Check the website in the upcoming weeks for availability. Once the kits are released, several web pages will be launched with kit instructions, deck weathering tips, prototype details, and super detailing tips. Lumber loads and a side board add-on kit are coming soon to augment these flat car kits. Jason hopes to offer additional variations on this prototype car design in the future. I know I’m looking forward to adding a pair of these flat cars to my fleet.